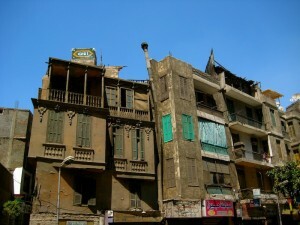 Arriving in Cairo was possibly the biggest contrast between two cities we had had on this trip. Actually the biggest contrast between two cities in the same country that I had ever seen. We went from Luxor, a city of 350,000 people, to Cairo, a city of a metropolitan population of over 17 million. It was massive, chaotic, industrial, western, but it still had that Middle East flare I had grown to love. People call crossing the street in Cairo a ‘chicken run’, I call it suicide… a run for your life… death at your doorstep… you choose. There is no such thing as a pedestrian crossing… actually no rules whatsoever. Hah! 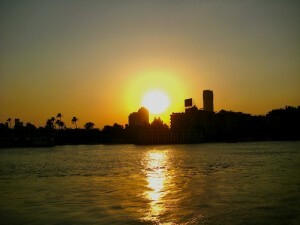 I had been fooled into thinking Damascus and Amman were crazy, but nothing compared to Cairo. We stayed at the Canadian Hostel for the last two nights of our trip. You can’t help but feel a little melancholic during the last few days of a trip like this. However, I tried not to dwell on this. 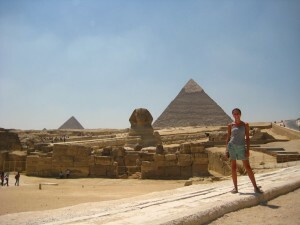 We refreshed a bit at the hostel before heading out for the famous town of Giza…. to see a few pyramids. We took the bus for locals, which was advised by the hostel not to take, and instead to take one of their tours… some things never change. If it’s one thing I can recommend to any travelers that will do this trip is to never do any tours, even if they say ‘we don’t recommend doing that’ it’s fine… really. If we can do it anyone can do it. It’s a cheaper and more local way to see the real city, at it’s best (and worst). Walking up the hill to get our first glimpse of the Pyramids was something I can’t even describe. It’s like seeing the coliseum in Rome for the first time, or the Eiffel tower in Paris, or even the Christ the Redeemer statue in Rio de Janeiro… but WAY cooler!! They are massive and just to give you a little history behind them… they are located in a city called Giza about 25 km from Cairo and were said to be constructed in and around the 23rd Century BC. All three pyramids stand at over 400 feet. I highly suggest reading more history about the pyramids as the construction is phenomenal and hard to comprehend the level of precision completed. Oh and the scams! The pyramids are full of them. G was getting pretty frustrated at this point so much so that you end up being really rude to the guys that are hassling you and then they make you feel bad about it! Some even pretend to be officials and police so you have to be really careful. 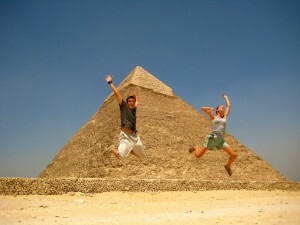 We spent most of the day around the pyramids in 48-degree heat and humidity. Love it. The Sphinx was super cool too! People told us that the best view is from the Pizza Hut just outside the grounds of the pyramids. We went there for lunch and indeed it is well worth it. You have a sweet view while munching on pizza and pondering the likes of King Tut and Cleopatra. What more could you want? Oh yes, air conditioned too! I wish we would have been able to go to Saqqara, but time was against us now. That night we were exhausted and went to bed relatively early after a nice dinner out. After all, the next day consisted of the Egyptian museum, discovering Cairo, Khan El-Khalili, Cairo Tower and the Al-Azhar Mosque! We did just that. Cairo was full of excitement round every corner and the best way to discover it, like any city, is to just walk! We ate at Falefal that night and dined in style with other local Egyptians, eating only the best ful, mashed potato sandwiches and Egypt’s national dish, Kushari. Kushari is a mix or rice, lentils, chickpeas, and macaroni in a spicy tomato sauce with caramelized onions on top! Mmmm! Tonight we will leave on the last bus to the airport. Where we will depart Cairo at 4:30 am, head to Athens and change flights for London…right back to where we started. London may be the same, but I for sure am not.